Its almost Easter, and if you looking for something cute and affordable that isn't junk food to add to your Easter Baskets, look no further than Uncle Milton. 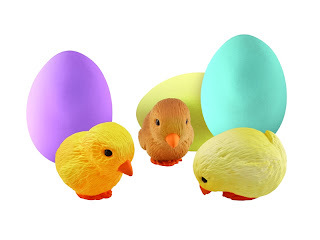 There adorable Hatch ‘n Grow Chicks are the perfect gift for kids of all ages. My family received a pair of chicks to try out and they were all excited, but none so my much as my three year old daughter. She thought the colored eggs were cool even before she knew there was a chick inside of them. When I explained it to her, she couldn't wait to see how it worked. All you have to do, is place the eggs in a container of water. As the little chick inside soaks up the water, it grows. Around 24 hours after we submerged ours, the eggs began to crack, just like real chicken eggs. A few hours later, a little chick emerged from the shell. Willow loves her chick and has been playing with it non-stop since it hatched. The chicks are lots of fun and a great way to get into the holiday spirit. In addition to the Hatch ‘n Grow Chicks, Uncle Milton also offers many other wonderful toys featuring themes like Star Wars, Ant Farm, Dinosaur Train and more. Any of these toys encourage imaginative play would make a great gift this Easter season. To see all that this fabulous company has to offer, you can visit their website. To keep with with new products and promotions, be sure to follow them on face book or twitter. So what are you waiting for? Check out Uncle Milton's Toys today and get your kids geared up and ready to explore their worlds, both real and imaginary. One lucky winner is going to receive a chick in each color! This giveaway will end on 3/14/13. Open to the US only. The winner will be notified via email and will have 48 hours to reply. Thanks again to Uncle Milton for offering this fantastic prize. My grandson would love the Dinosaur Train Dino Poop™ ! I also like their Mini Farm Projector. I like the Planet Frog. My sons would also love the Aquasaurs Prehistoric Creature Habitat! I think my kids would LOVE just about everything on this site!! We would find the Giant Ant Farm very fun to have. My kids would love the Roly-Poly Playground. Love the John Deere Farm Dough! They would like The Roly Poly Play Ground! The ant farm would be fun, we've never had one! I like the John Deere Ant Farm. I have purchased the Butterfly Jungle in the past for nieces and nephews and totally recommend it. I do like the Ant Farms and think I might get that for my son! My daughter would love Uncle Milton's Ant Farm Live Ant Habitat. My son would love the Ant Farm Revolution. My son would love the Fireworks Lightshow In My Room™. I like Rainbow in my Room. My grandson would love the "Bug Jug". I like the Butterfly garden. They would love any of the Fireworks Lightshow items. My favorite is the The Cyclone Pinwheel Light Show! The Anteater Bug Vac would be alot of fun for my daughter. The Anteater Bug Vac looks very nice!